This article explains the options available on device page. These options will help you use the devices effectively on pCloudy platform. pCloudy is a feature rich platform and supports whole lot of features to ease your device interaction. There are many single click options to speed up your testing on devices. On connecting to a device, You will see many icons in the top pane. Lets understand what each of these icons/features does for you. 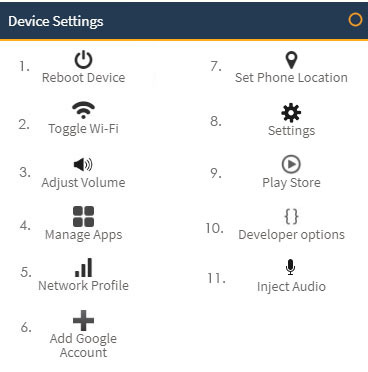 pCloudy's Device Settings tab has lot of commonly used features and device interactions. Some of the key features to test are Network, Location and Audio. Lets see those in details.